New York real estate agents and brokers are required to complete 22.5 credits of continuing ed credit hours every two years. We have a lot of NY real estate agents calling and emailing us about the real estate license renewal process, so we decided to write this article, to help agents find the answers they need quicker. Can New York real estate agents and brokers complete their continuing ed courses online? Yes, all NY real estate licensees can complete all 22.5 credit hours they need online, in a physical classroom, or through a hybrid of both. When is a New York real estate licensee eligible to complete the 22.5 credit hours? NY agents and brokers can complete the 22.5 credit hours at any time during the 24 months immediately preceding their license expiration date. Does New York require mandatory real estate continuing ed topics? Yes, there are two topics the State of New York requires both agents and brokers complete: Agency and Fair Housing. Can New York real estate license renewal forms be filed online? If I completed more than 22.5 credit hours in the previous renewal cycle, can I apply the extra credits to the current renewal period? No, New York real estate continuing ed credits cannot be “carried forward” to use in a future renewal period. Licensees must complete all 22.5 hours during their current renewal cycle. How much does it cost to renew a New York real estate license? The cost to complete New York real estate continuing ed courses online range from $10-$129+ for all 22.5 credits. With regard to renewal fees payable to the State of New York, Agents pay $55 and Brokers pay $155 to the state. There is a late payment penalty of $200, so be sure to renew your license on time or even a few days/weeks early. Will I receive any notification before my NY real estate license expires? The State of New York sends out renewal notices via email and snail mail to each licensee approximately 90 days prior to a licensee’s expiration date, so make sure your address on file with the state is current. 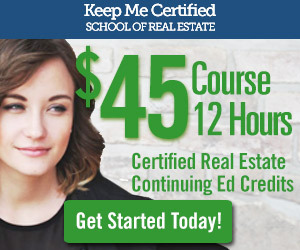 Is Keep Me Certified a New York approved online real estate school? Where can a real estate licensee check the status of their New York real estate license? https://www.dos.ny.gov/licensing/eaccessny.html – The state offers an online licensing portal for licensees to search and confirm the status of their real estate license. 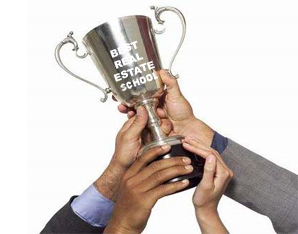 Do real estate schools submit course completion credits to the state? Yes, all real estate schools (online and off) are required to submit all credits completed by New York real estate agents and brokers within 10 days of their completion. Keep Me Certified submits continuing ed completion credits every seven to 10 days. Licensees can renew their real estate license online at any time. Licensees do NOT have to wait to renew their license until the state receives their credits. In other words, licensees can renew their real estate license online through the New York elicensing portal once the credits have been completed. Have more questions not answered in this article? The State of New York offers an online FAQ page specifically for real estate agents and brokers.